Exclusive Beach Colony is located on 11 acres of fabulous beachfront. The ingenious angular living room design transforms every residence into a Corner unit. Wall-to-wall sliding doors and adjoining windows actually wrap around the living room, filling it with light, and revealing the panoramic beauty of the Gulf. The sweeping 300 SF terrace will be a favorite spot for quiet moments and lively gatherings alike. The uniquely situated Master Bath is a world unto itself. The extra deep soaking tub is surrounded by large, wrap-around windows, which can open to offer both a view and a feel of the hypnotic Gulf. 1683 SF with custom tile throughout Living, Dining, Kitchen and Bedrooms. Electronics include 60 in TV and Blue Ray Player in Living Room, 40 in TV in Master Bedroom and 32 in TV in 2 guest rooms. For those who expect only the best, Beach Colony Tower 12C is included in our collection of outstanding luxury vacation properties and is guaranteed to please the most discerning guest. A NOTE FROM THE OWNER: Welcome to our home, Perdido-Soul. Here you will find warmth in the sun which will revitalize your soul. 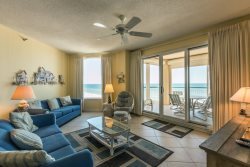 Perdido Key is known for its sugar white sand beaches, emerald green waters, a beautiful small town atmosphere, yet close to the historic city of Pensacola and vibrant activities in Orange Beach. Our 12th floor home features an interior completely redecorated in Spring, 2016. A casually furnished living room has two recliners, a 60 in flat screen TV and Blue Ray Player with extended cable package. The dining room includes a rustic dining table that seats 8. Our kitchen includes all new cookware and tableware, stainless appliances, quartz countertop and Keurig Coffeemaker. Bedrooms have all new beds with high quality mattresses and including 40 in and 32 in flat screen TV's. The master suite has a completely remodeled bath with granite countertops, double vessel sinks and a deep soaking tub that overlooks the gulf. Be sure to use our coffee table guest book for information on our favorite restaurants and attractions. Please leave a note--we want to know that you enjoyed our home. Beach Colony is our favorite! We love it there!! The staff was very friendly and helpful and able to give great recommendations about area attractions and dining. We loved the condo and the amenities and will return in the future! The condo is beautifully decorated, practical and has a stunning view of the water! Everyone on the team was very helpful and courteous. Not one complaint about the team. Our unit was on the 12th floor and had a beautiful view. It was very clean and also had the things necessary for us to clean the floors since we had a little sand that made it up to the unit. Our kitchen had everything that we needed. We loved it an would stay there again. Erin was helpful, friendly, knowledgeable and we enjoyed interacting with her. Amber was very helpful and the unit was great!